A LIMERICK WOMAN says hello from Ho Chi Minh City, a naval officer off the coast wishes her father in Bere Island a merry Christmas and a newly married Dublin couple tell their families that they’re heading away for the festive season. That’s the idea behind An Post’s current advertising campaign, which encourages people to “send love” this Christmas. While the concept may be relatively simple compared to John Lewis getting Elton John on board, Keith Lawler, head of art at creative agency JWT Folk, says he was inspired by his own experiences when developing the campaign. “I lived abroad myself for four years and spent three Christmases away from my family. So when we got the brief from An Post about connecting people for Christmas that’s what I thought about,” he tells Fora. Fiona Heffernan, commercial director at An Post, says that the basic brief was around sending mail to and from family members who won’t be around at Christmas – the service’s busiest time of the year. “We were starting with the premise that a lot of people won’t be home for Christmas this year, and how important it would be to send a package or a card,” she adds. Once it was decided that the campaign would feature real Irish people who could surprise their families, the challenge came in finding and selecting the right ones to appear in the ads. “Every family has people who are away at Christmas for various reasons, and we wanted to get different situations so it would be relevant to lots of people around the country,” Lawler says. The first idea was to track down someone who was living abroad and wouldn’t be home this Christmas. The team contacted GAA clubs around the globe to get in touch with Irish communities abroad, and ended up conducting Skype interviews with people in various cities. “We found lots of people in Dubai, Korea, Taiwan, and eventually we found Alison who is living in Ho Chi Minh City in Vietnam but is originally from Limerick,” Lawler adds. The second idea was to find a couple that would be heading away for the holidays and “ideally a couple who had just been married and this would be their first Christmas”, according to Lawler. From filming a wedding ceremony and strolls around the capital, the team then went to a naval vessel in the south Irish sea for the third ad. “We were originally looking for someone like a first responder, a firefighter, someone from the Gardaí or the lifeboat service,” Lawler says. “But a lot of the people who came back to us were going to be on call for Christmas day, so it wasn’t definite that they’d be away from their families. Each of the three ads gives a small insight into these people and their families, but there were no scripts involved, according to Heffernan. “Part of the strategy behind it was not to script the ads. We had ideas and scenes that we needed to capture, but whatever the individuals said was authentic and it was their own stories,” she says. Christmas ads are big business. The UK’s advertising association forecasts that businesses there will spend around £6.4 billion on seasonal advertising this year, up 5% compared to the previous record set in 2017. 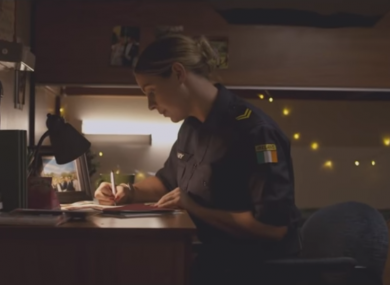 But Lawler says that the budget for An Post’s campaign was more modest than for some of the high-concept ads that have appeared on Irish screens in recent years. “It was a very small crew, probably a fifth of the team you’d have on a normal TV ad. There were around 10 people on set in total and for a big ad you might have closer to 50 or 60. We kept everything really tight and small. “Some brands definitely put big budgets behind Christmas ads – it’s a huge time because a lot of people are watching TV, and it’s the most expensive time to buy media spots, so people invest a lot. An Post’s ads were recorded on hand-held camera, with a small team travelling to each location and shooting for around a day. “To be honest, it was all a quick process because we didn’t always intend to do this campaign. The client had a different idea in mind initially,” Lawler adds. Although the ads were only finalised in the last couple of months, An Post started preparing for the Christmas campaign slightly earlier. “The process starts at the very beginning of the year. As soon as Christmas is over we get started for the next Christmas and have research ready to go in January,” Heffernan says. An Post has released several different Christmas campaigns in recent years, but Lawler says that its Snowman ad, which was first released in 2005 and ran for several years, is perhaps the postal service’s best-known. “The nostalgia factor from the likes of the Coke or Corn Flakes ads is really appealing to a certain demographic that remember it from when they were kids. It makes sense for a brand to really tug those heartstrings. For An Post, the motivation behind having a fresh ad campaign this year was to encourage people to find reasons to send physical cards and packages in an increasingly digital age. “Sales of stamps have declined over the last number of years but we have seen growth in 2018 – we attribute some of that to the ad campaign we’re running this Christmas,” Heffernan says. Email “An Post made not one but three Christmas ads this year. Here's how - and why”. Feedback on “An Post made not one but three Christmas ads this year. Here's how - and why”.